I used to be strictly old school when it came to portable ventilators. My belief was if it was built like a tank, it was reliable. And for the most part, I was usually correct. You could hit my old ventilator with a sledgehammer fifty times and it would still deliver. It was indestructible, the consummate workhorse, hefty and tough. But we are in an age now where technology has gone digital and is giving way to smaller, more efficient devices. Very soon the old analog stuff will be rendered totally obsolete. And ventilators are no exception. The manufacturer ceased production of my ventilator a year ago and will only service and support these machines until 2014. I realized that it was time for me to quit kicking and screaming and accept change. It was time for me to jump into this digital world. It was time for me to get a new ventilator! 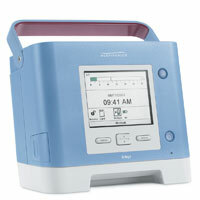 Enter the Trilogy100 by Respironics, a modern replacement for my trusty old tank of a machine, the Respironics PLV-102. The Trilogy is much smaller and twenty pounds lighter than my previous rig, and far more versatile. This little technical wonder comes with a detailed digital display, and even houses an SD memory card, which keeps a record of patient ventilation settings. The machine itself also provides an unrivaled six hours of battery life! I started on the Trilogy two months ago and have never looked back. Numerous adjustments and frustrations had to be dealt with in the early stages, but now that I have gotten used to this new toy, I don’t even know it is there. Breathing is my friend, and the Trilogy does a great job in preserving this relationship. And although my old analog machine is slated for a spot in the respiratory home, I will never forget twenty years of dedicated service.